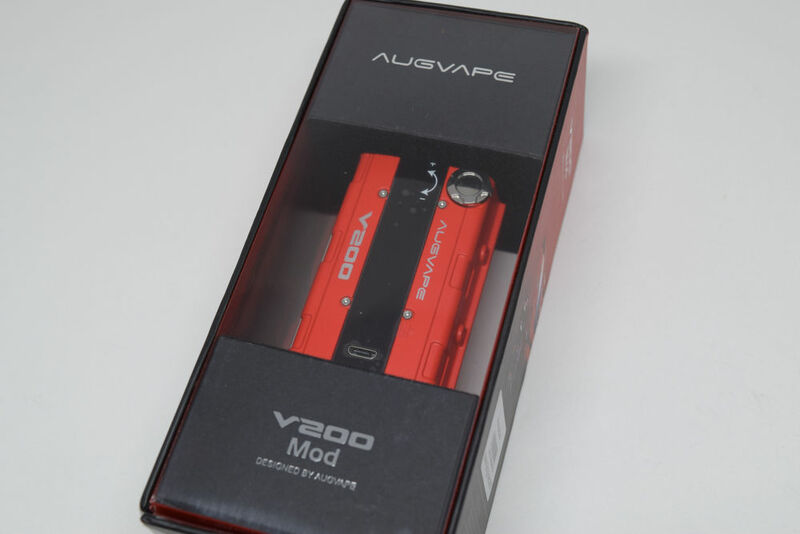 The V200 dual-battery mod from Augvape comes in a large rectangular cardboard box with transparent plastic panels that offer a clear view of the actual mod. I love the fact that the box looks more like a case meant for something really precious, and it’s just a change from the classic cardboard boxes that most mod manufacturers use. On the bottom of the box we have a short list of contents, and on the sides you’ll find the legally-required warnings as well as photos of an actual Honda B18C-R engine, even though it clearly says Augvape V200 on it. As far as I know, this is not an official collaboration with Honda, in fact the ‘Honda’ brand doesn’t show up anywhere on the packaging or on the product page, but the mod is designed as a hand-size version of the iconic car engine. Inside the box, we have the mod – I received the red version for this review, but you can also find it in black or white – a small user manual which I suggest you go over, and a braided USB cable for charging. I don’t know if this mod is firmware upgradable, as I couldn’t find any information on this anywhere. 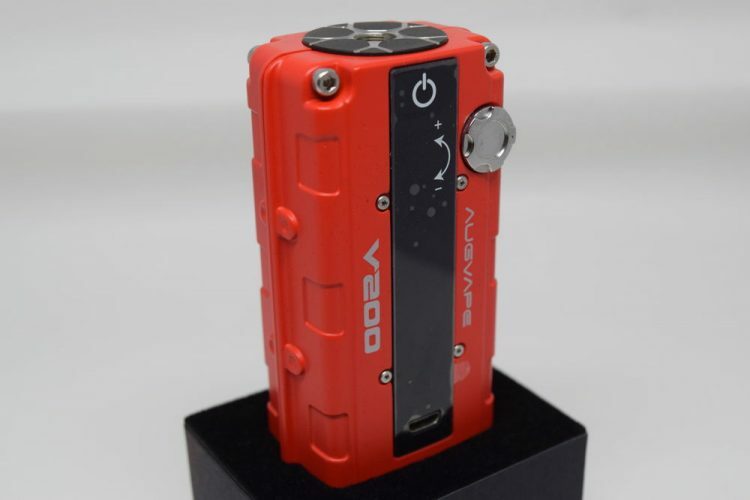 The design of the Augvape V200 is by far its main draw, at least in my opinion. Whether you’re a Honda engine fan, a fan of car engines in general or someone who knows absolutely nothing about cars, you’re going to love the unique look of this device. 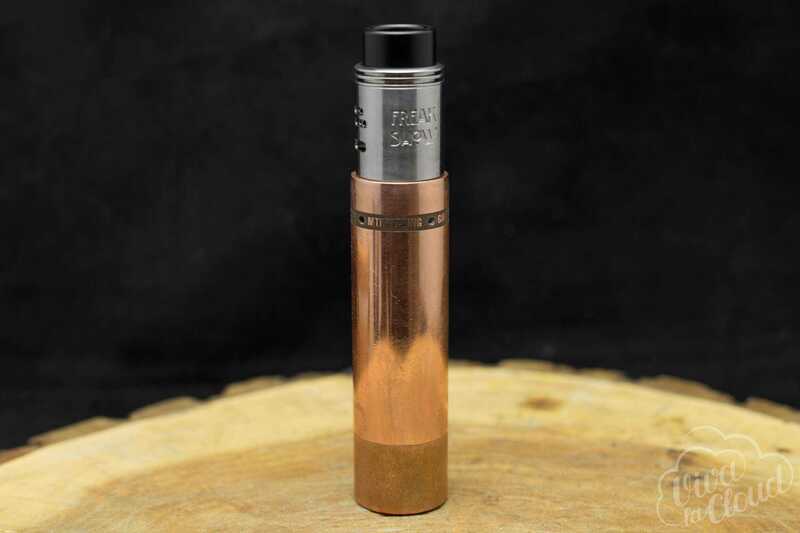 It looks like a standard dual-18650 mod at first glance, but Augvape has managed to integrate a number of details that really make it stand out from its competitors. The V200 mod is made primarily of zinc alloy and measures 87.5mm x 45mm x 29.2mm and weighs about 165 grams without batteries. After you’ve inserted the two 18650 batteries, you can expect the weight to be around 300 grams. That’s a bit heavier than most compact dual-battery mods on the market, but I certainly wouldn’t call than a con. Quite the contrary, the metallic body and the extra weight just give this mod a very rugged feel, which I for one appreciate. However, it’s also surprisingly comfortable to hold and use. I definitely don’t have the largest hands, but I still found the V200 to be very ergonomic. And then there is the car engine design. 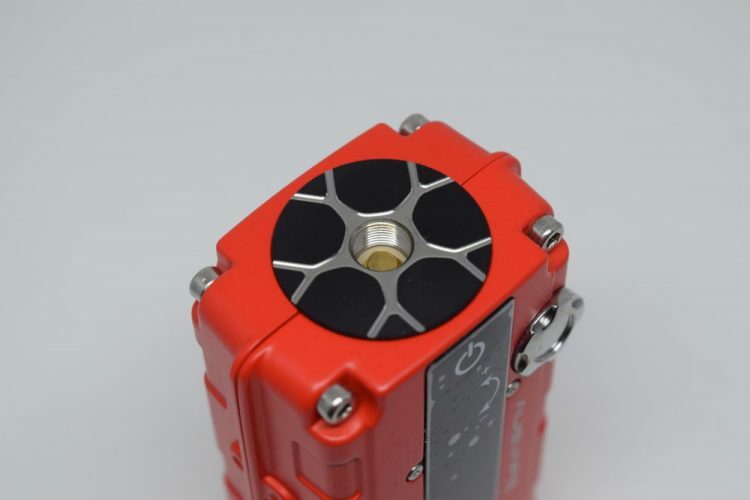 All you have to do is google photos of the legendary B18C engine cover and you’ll see that Augvape have designed this mod to replicate that wonder of Japanese engineering almost to perfection. 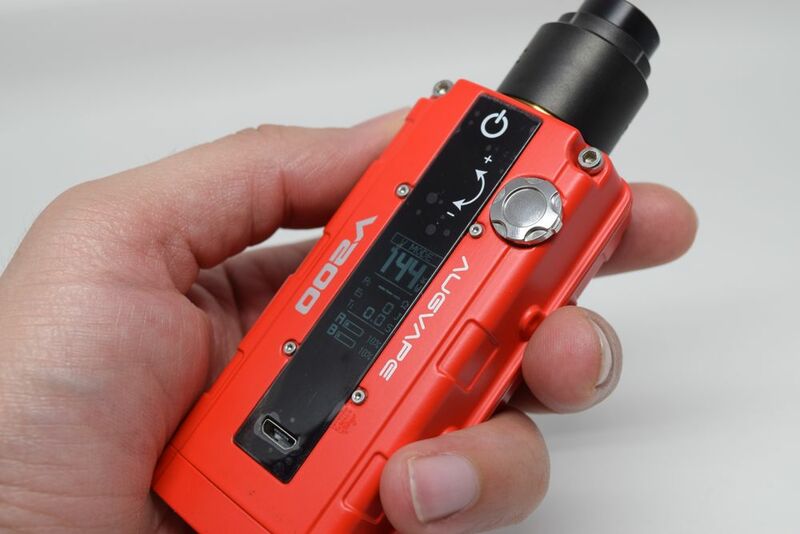 From the iconic red color – which I definitely recommend you choose out of the three available variants – to the stainless steel oil cap and the large screws near the top, this mod looks like a hand-sized version of Honda’s famous Type-R engine. It’s a beauty. 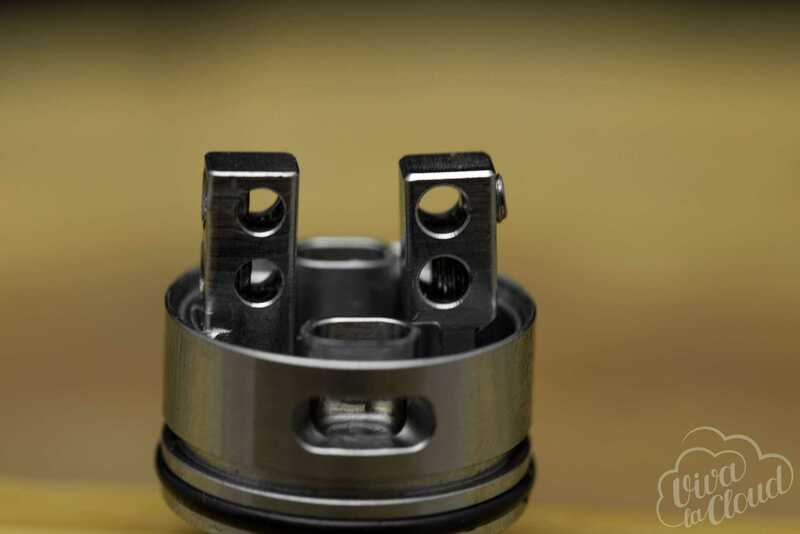 On top of the mod, we have a centered, spring-loaded 510 connection with a gold-plated pin. 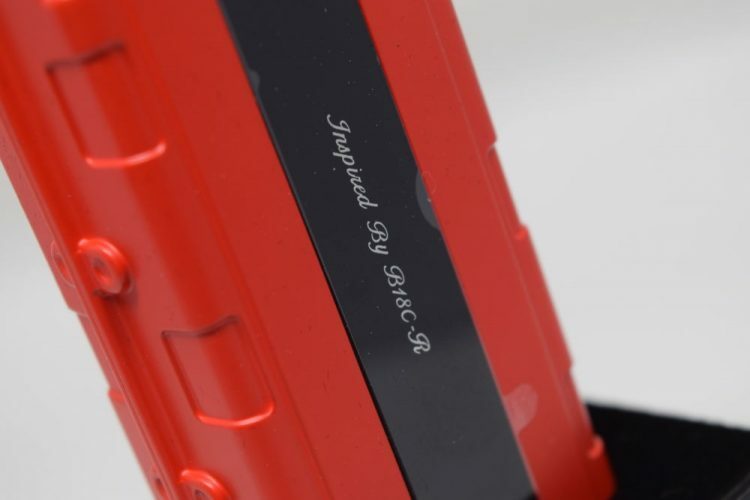 The connection doesn’t sit flush on the mod, but on a slightly raised metallic plate designed to look like a sports car rim, to fit the theme of the device. 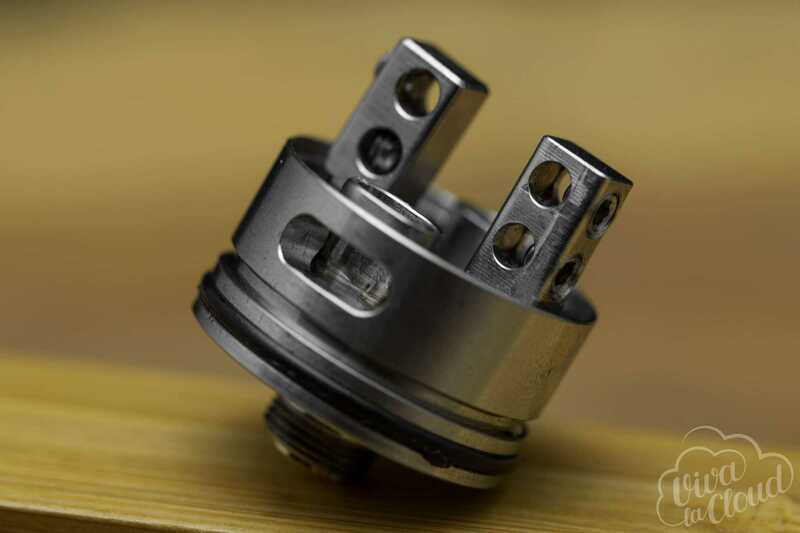 The plate has a diameter of 25mm, so any tanks over 25mm will overhang slightly, but that shouldn’t be a big deal, as not a lot of vapers use such large diameter tanks anyway. On the bottom we have a classic hinged battery door. This is by far my favourite style of battery door, because of how easy it is to operate and because you never have to worry about it wobbling or popping off accidentally. 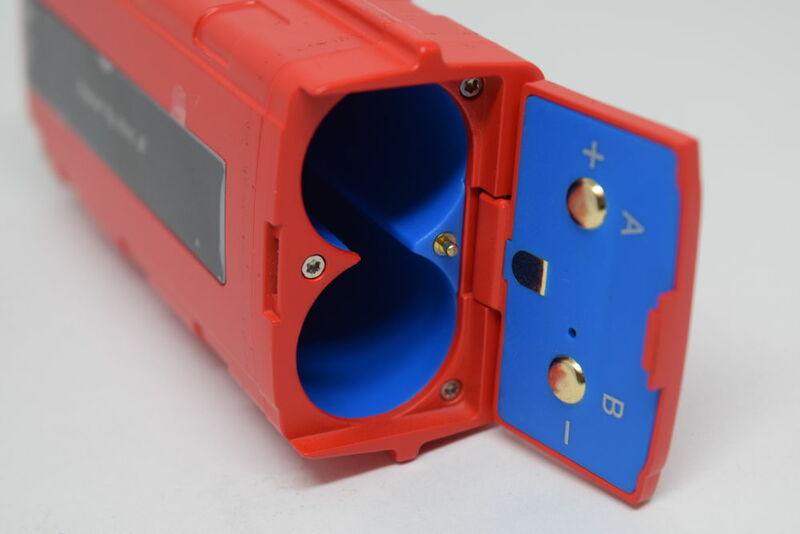 The battery polarity is clearly indicated on the inside of the battery door, and the battery compartment is properly insulated to avoid unwanted short-circuits. 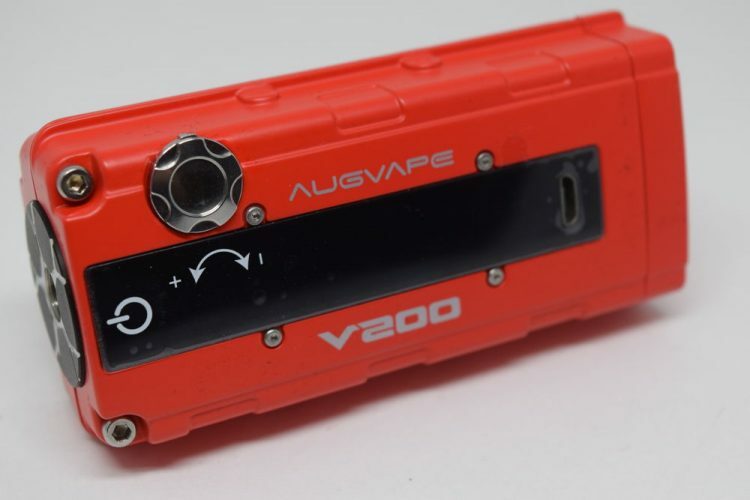 The black, glossy strip on the front of the Augvape V200 houses a concealed fire button at the top, as well as a rectangular LCD display and the micro-USB charging port. Next to this strip, we have the oil cap, which in this case is actually a knob that replaces the classic ‘+’ and ‘-‘ buttons. It can be flipped up and down to adjust the power output. Before we wrap up this section, I want to touch on the concealed fire button of the V200 mod. In some of the photos I took, you can clearly see it marked with a power symbol, but that is actually etched on the protective plastic film that the mod comes with. Once you remove the film, the indicators will be gone as well. So you’ll always know where the button is located, but for someone seeing the device without that protective film, it will be a mystery. While integrating the button so well into the general design of the mod was clever and ingenious, getting used to it took a while, at least for me. The pressable part of the black strip ends at about the top of that oil cap knob next to it, and without an indicator, I sometimes tried pressing further down the strip and nothing would happen. I’ve gotten used to it now, and I quite like the clicky button, but just know that’s it’s a bit different than regular fire buttons. As a whole, the Augvape V200 is one of the most high-quality mods I have ever used. I love the car engine design with all the tiny elements included, the build-quality is outstanding and I just love the feel of it in my hand. It’s weighty and robust, but at the same time very comfortable to hold and use. 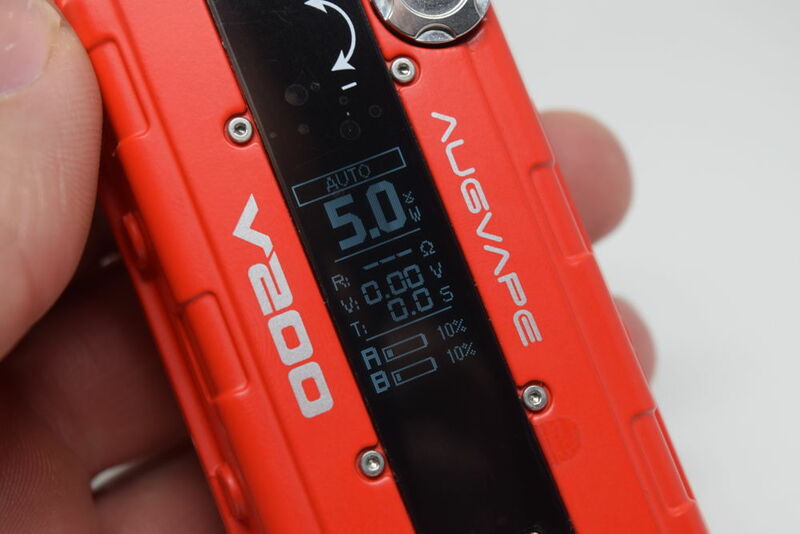 I would definitely describe the Augvape V200 as an advanced vape mod, but in terms of menu, navigation and available features, it is considerably simpler and more accessible than most other mods in this category. That may be a pro or a con, depending on what is more important to you, simplicity or available features. Anyway, to turn on the V200, all you have to do is press the fire button five times in rapid succession. On the display, you’ll see the current operating mode of the mod at the top, right under that we have the current power output, and further down the resistance of the atomizer, the voltage, a puff time, and finally, two separate battery indicators. It’s a very simple layout, which I’m sure minimalists will appreciate. To adjust the power output, all you have to do is flip the oil cap knob up and down. If you flip any direction and hold it, it will go from the minimum power output of 5W to the maximum of 200W. It does pick up speed after 5 seconds or so, but in the beginning it scrolls through this power range pretty slowly. It also round-robins if you flip the switch again once you’ve reached the minimum or maximum values. To go into the menu, you have to press the fire button three times, while the mod is turned on. You will see the operating mode highlighted in white, and if you flip the oil cap knob up and down, you will be able to scroll through the three available modes – Auto, BP (Bypass) and V Mode. ‘Auto’ is your regular wattage mode, ‘BP’ lets you use the V200 mod as a mechanical mod, drawing power straight from the batteries, but with the built-in protections still active, and ‘V Mode’ apparently provides a small boost in power ramp up, sort of like a pre-heat option would. You may notice that depending on what mode you are in, the voltage (V) sub-parameter on the display will switch to something else. So in Auto it will be voltage, in BP it will be watts (W) and in V Mode it will be joules (J). That’s about all there is to the menu. It only allows you to change between these three operating modes, and it all happens on the home screen, so you don’t have to get lost in sub-menus or obscure options that you don’t really need anyway. Oh, and you may have noticed that there is no Temperature Control mode. That may be a big con to some vapers, but it doesn’t bother me one bit. If you’ve read any of my other mod reviews, you probably know that I am not a big fan of temp. control vaping, and that I prefer good ol’ wattage vaping instead. So this is a perfect mod for me, but if you’re into temperature control, the V200 is definitely not for you. Finally, I should point out two relatively important button combinations involving the oil cap knob. If you press the power button and flip the knob up simultaneously, you will lock the knob, but you will still be able to use the power button. If you press the fire button and flip the knob down, you will lock only the fire button, but not the knob. You can also lock both the knob and the fire button by performing both operations one after the other. As I mentioned, the Augvape V200 is not the most feature-rich mod on the market, but it does have the core features that most vapers use on a daily basis, so if you prefer simplicity, you may consider this a pro rather than a con. I’m not sure what type of circuit board the Augvape V200 is powered by, in fact this is my first Augvape mod, so I don’t know too much about the company, but I’ve been impressed with both how efficiently it manages battery life and how fast the mod fires. I don’t have the technical know-how or the equipment to properly test it, but from a user perspective, I’d say the Augvape V200 is on par with the VooPoo Drag in terms of firing time and power ramp-up. I have been using the V200 mod for over a week now and I’ve had no issues with it whatsoever. As I mentioned before, getting used to the concealed power button took some time – about a day – but in terms of functionality and and performance, this device has been a joy to use. The fire button is incredibly responsive, firing up the coils virtually instantly and the power ramp-up is impressively fast as well. I’ve experienced no misfires or other errors of any kind, so as far as I’m concerned, this is one of the best performing mods available on the market. 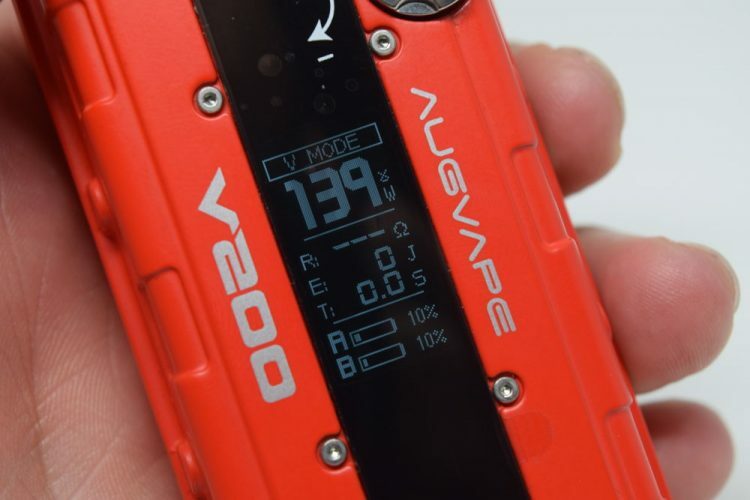 If you’re into temperature control, or if you regularly use functions like TCR or custom power curves, the Augvape V200 may be too basic for you. On the other hand, if you prefer raw power, I guarantee you will be impressed with this device. If you’ve read up to this point, you already know how I feel about this mod. For those of you who simply scrolled down for the “too long, didn’t read” version of this review, this is a damn good vape mod. 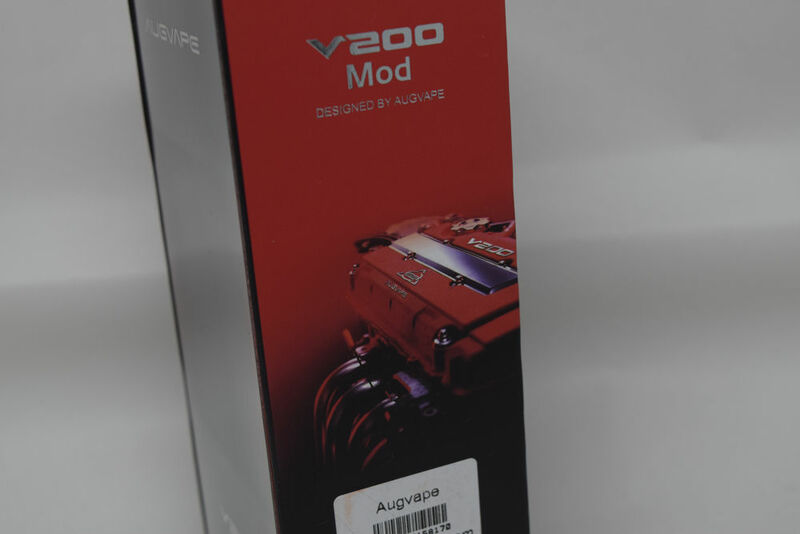 From the exquisite car engine design and top-notch build quality, to the incredibly fast firing time and excellent performance, the Augvape V200 is a very impressive device. Is it perfect? Definitely not. Fans of temperature control and feature-rich mods will most likely be disappointed with the mod’s simplicity compared to similar dual-battery mods, but luckily there are plenty of other options to choose from. As a vaper who just needs power mode and cares more about performance than a bloated menu system, I can honestly say that the Augvape V200 is an excellent mod. I have fond memories of the CUBOID Pro, one of the first touchscreen mods I ever reviewed. The CUBOID Pro not only featured an innovative touchscreen feature but it was also a high-wattage device that allowed for a myriad of vaping outputs. The CUBOID Tap does not feature a touchscreen, but it does borrow from the CUBOID Pro regarding the firing button. 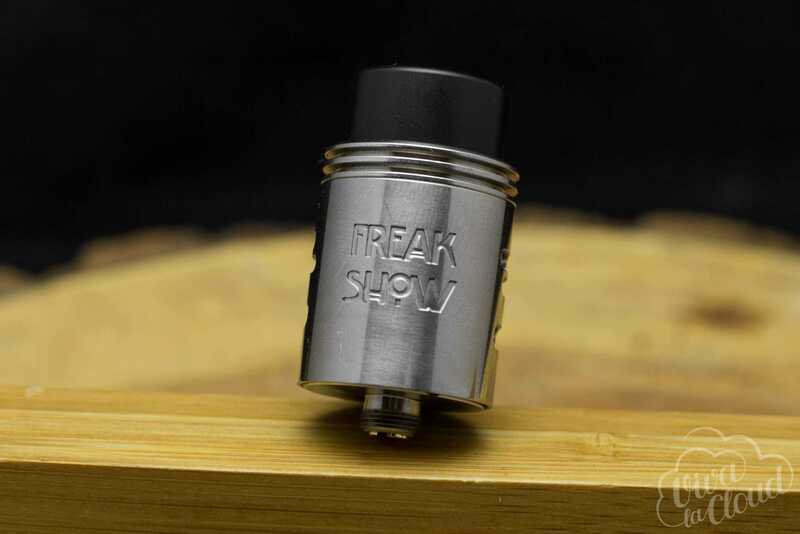 The CUBOID Pro featured two firing options; on one side you had a standard firing button, and on the other side you had a solid panel that underneath featured TAPTECH technology that only required a firm press to fire the mod. The CUBOID Tap takes that concept a little further by also featuring a selector panel underneath the screen that works just like the up and down buttons would on a regular mod. But the presence of TAPTECH technology is not the only thing that sets the CUBOID Tap apart. Just like with the CUBOID Pro, the Tap comes with the ProCore Aries tank and is powered with two removable 18650 batteries, which are bottom loaded. The CUBOID Tap is also a powerful device, reaching a maximum power output of 228W. One thing I noticed right away about the Joyetech CUBOID Tap was its color options. I looked at the other options they had since I was unimpressed by the all-black and most boring version that I was given. There are a total of five different color options (yellow, silver, black, red, and blue) and rather than coming in solid colors, each version has its own eclectic and stylish sticker pattern. I especially liked the silver version, which was contrasted nicely with a faux wood-panel sticker that stood out. 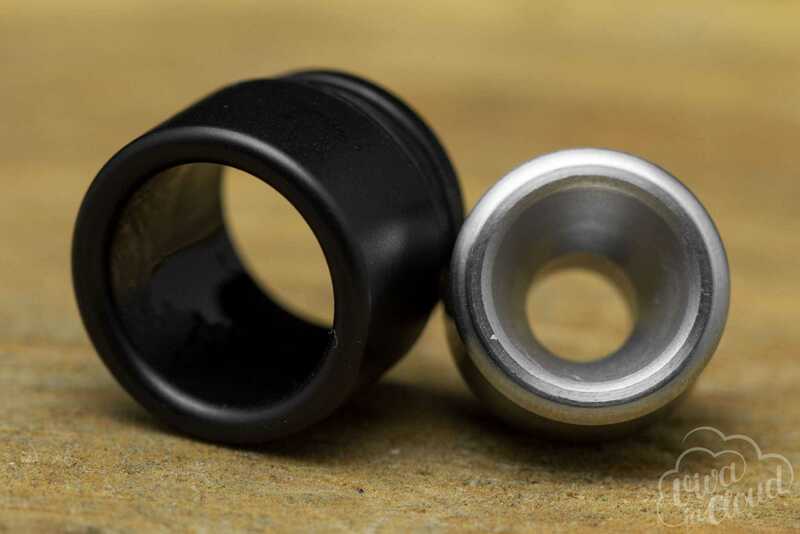 But, moving on to the rest of the device, the entire mod is made of a zinc alloy with a carbon fiber finish that feels smooth and satisfying to touch. The mod is quite tall at close to 130mm with the tank attached, and combined with the tap tech; it might not be the ideal choice to take with you on the go, even though there is a locking feature that prevents accidental firing. Add in the weight of the two 18650 batteries and the CUBOID Tap becomes almost like a ball and chain. The centrally-placed OLED screen measures a sizable 1.3 inches and reads out a bevy of important vaping information. Looking at the base of the Tap, you’ll find the battery door that gets pushed out and down to reveal the battery ports. Underneath the thin, flat touch panel you’ll also see the USB charging and upgrade port. Above and below the screen is where you’ll find the stars of the show, the two flat panels that represent the second firing button and the two selector buttons, which are both tap-activated. You should keep in mind that “tap” is not the same as “touch”; the panels are not touch-panels where you lightly apply your finger to make a change. With these panels you have to press down hard, as if it were a real button, to initiate any change or modification or to fire the device. The standard firing button on the side of the device does not have any noticeable rattle to it, and it must be used to turn the device on, as well as to enter the menu. Further still, the two sides of the Tap are pressure sensitive and belie functions of their own, like being able to set your TCR value when the device is powered off. You would usually make such an adjustment through the mod’s main menu or by using the firing button. Making the switch to the squeeze option didn’t make that much sense, although at least Joyetech tried to justify it. When the mod is on, you can also use the squeeze method, by clutching both sides of the mod, to enter the menu system or to lock the buttons by squeezing three times. I already mentioned how the device needs to be turned on using the regular firing button located on the side of the device by clicking it five times. Once the Tap is turned on, the main menu will display all your vital displays like temperature, wattage, coil resistance and puff counter. Now the way you get into the menu options can be a little tricky. You can click the side firing button three times to enter the menu choices, which range from power mode to TCR mode to temperature control for titanium, nickel and stainless steel. There’s also an analog clock option that you can choose to adjust. Once you have made your selection, you need to press that firing button to confirm. One great thing that Joyetech added to the Tap is a small internal motor that sends out a low vibration every time one of the tap buttons is used, so you know that it is working. The ProCore Aries tank has passed through these pages before. The last time was with the Joyetech EKEE, and it also came with the CUBOID Pro. I’ll just say, I liked the ProCore Aries then, and I love it now. The top-fill feature works just like a SMOK tank whose name currently escapes me, the Spirals or Cloud Beast King? But the top cap is pushed back and can then flip open as well to reveal two very sizable fill ports. The tank can also come apart for easy cleaning and maintenance. The coils included in the CUBOID Tap kit are the ProC1 and ProC4 that have a combined vaping range between 40W and 110W. I stuck with the pre-installed ProC1 coil and vaped at the tail end of the ideal range of 55W-65W for this coil at 65W. The vapor was a delight, almost frothy and left a lengthy trail. I was so pleased with my e-juice too, Marshmallow Man 2 by Donuts E-Liquid. I don’t know what it was about the CUBOID Pro that pushed me to choose a rich, sweet and creamy tasting e-liquid, but the choice was the right for this mod and these coils. Tapping the panel to fire the device did not result in any delays, and the mod fired almost instantly. I found the selector buttons also quite responsive. I don’t usually like making a comparison between two products from the same company, but the inclusion of that proprietary TAPTECH technology left me with few contenders, so I decided to revisit the CUBOID Pro to see how it would fare against its brand-mate, the Tap. And right from the start, however, the CUBOID Pro does have some obvious advantages. Joyetech clearly wanted to deploy their tap tech onto a larger scale, without being overshadowed by a touchscreen. The Tap is that attempt, but I’m not sure that it succeeds in being the right platform. The squeeze factor was excessive and it led to misfirings and modes being changed inadvertently, or the keys being locked and the stealth mode turning on and off. The Pro made smart use of the tap tech by restricting its use and letting the touchscreen do most of the heavy lifting. On the Tap, however, the tap tech is overburdened and the confusing amount of different button combinations and controls only made things worse. It vaped exceptionally well, and its disappointing that such a great device is brought down by a messy interface. The interface on the Pro, on the other hand, was as much a joy to use as it was to vape on it. I would give this one to the CUBOID Pro, based just on ease of use and functionality. Regarding vapor production, the Tap did a fantastic job. The ProC1 delivered superb and savory vapor, while all the vaping outputs performed just as expected. The mod also fired extremely quick. I think this is probably the first time that I’m giving a pro to a device for the different color options it can come in, but I think all of the possibilities were done exceptionally well and each of them was uniquely brilliant. The Tap feels great in the hand. Its carbon fiber finish was both great-looking and was comfortable to grip. Unlike the squeeze function, the tap buttons were not overly sensitive but did not require more effort than what was needed to fire the device or to use the up and down panels. Getting a good grip on the Tap meant enabling the squeeze function that often leads to unintended consequences. Even the CUBOID Tap user manual recommends against putting the Tap into your pocket or bag or purse due not only to the possibility of the squeeze function firing but also because of the size of the mod. Joyetech is all about innovation, but a lot of vape companies are, it’s just that Joyetech has a proven record of making discoveries and taking risks. The CUBOID Pro was a record of that, and the CUBOID Tap is also an attempt to break new ground. The Tap is a valiant attempt, but Joyetech overshot the landing. Sticking with just the tap buttons and leaving out the squeeze function would’ve been a better idea. The Tap performed amazingly well, and it was a joy to use the tap buttons, but a more restraint should be shown with any of Joyetech’s future advances.